Dolomite lumps are a common sedimentary rock and Udaipur, Rajasthan is rich in this mineral. Dolomite lumps is the cheapest filler any company can add to its products. It has neutral to low Ph, less reactivity and abundantly available. DOLOMITE lumps are a double carbonate of calcium and magnesium, (CaMg(CO3)2). it contains 30.4% of CaO, 21.7% of MgO and 47.9% of CO2. 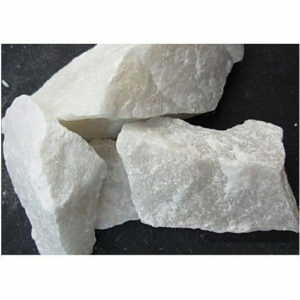 Dolomite is widely used in Iron Steel Industries, construction and building products, paints, plastics, rubber, soaps and detergent applications, Glass and ceramic industry as a source of magnesium, sintering agent in iron ore pelletization or as a flux agents in steel making. Dolomite has properties same as the mineral calcite, but it does not rapidly dissolved in dilute hydrochloric acid because of lesser percent of carbonate presence. Dolomite lumps are slightly harder, denser and never forms scalenohedrons. Dolomite decomposed completely above at 900ºC The product resulting from this relatively low-temperature and calcination is highly porous and reactive and is known as ‘calcinated dolomite’. Aiming to satisfy our clients, optimally, we provide our clients with a quality approved array of Dolomite Rock . Used as an ornamental stone, a concrete aggregate, and a source of magnesium oxide, as well as in the Pidgeon process for the production of magnesium. Price Range: Rs. 1000-2000/- per ton.